Aside from instant food, a quick, reliable complete-food source for a grad student is…egg. Eggs. Now, before you whip out your wellness-and-health magazines and condemn eggs as unhealthy, think of this in another perspective: cholesterol aside, eggs contain enough protein and fat to tide a starving person for a day. Yes, eggs are nutritious, and, cooked as is, very bland. This blandness makes eggs very versatile in cooking, as it can take any kind of seasoning (not to mention cooking styles). There’s the simple sunny-side up, there’s Julia Child’s omelet…and there’s tamagoyaki. Simply put, it’s just an omelet. A Japanese sweet rolled omelet. Usually found as a topping in sushis, or as a bento item (with octopus-cut sausages and cute baby veggies). What makes this one different from other omelets is the distinct sweet-salty taste from sugar and soy sauce. Nothing screams Asian (heck, even Japanese!) than this flavor profile for an EGG dish. And, for an omelet, it’s pretty easy to do. No need for fancy tosses! Crack eggs in a large bowl. Add soy sauce and sugar. Beat with a fork or a pair of chopsticks…but never with a wire whisk (you don’t want air bubbles in your mix!). Heat the non-stick pan at medium-high. Brush a thin layer of cooking oil on the surface. Wait until the pan is hot enough (guesstimate by holding an open palm 1” above the cooking surface). Pour a small amount of beaten egg in the pan, letting it spread into a thin layer. Wait until the rims set and the egg-layer is not that fluid or runny. With a turner (or a pair of chopsticks, or a fork), lift the nearest side of the omelet and begin rolling AWAY from you. Brush some oil on the now-clean surface of the pan before pouring another layer of beaten egg (lift the egg roll to let the egg mixture spread over the whole pan). As soon as it sets, roll the egg back towards you. Repeat the previous three steps until you run out of beaten egg. 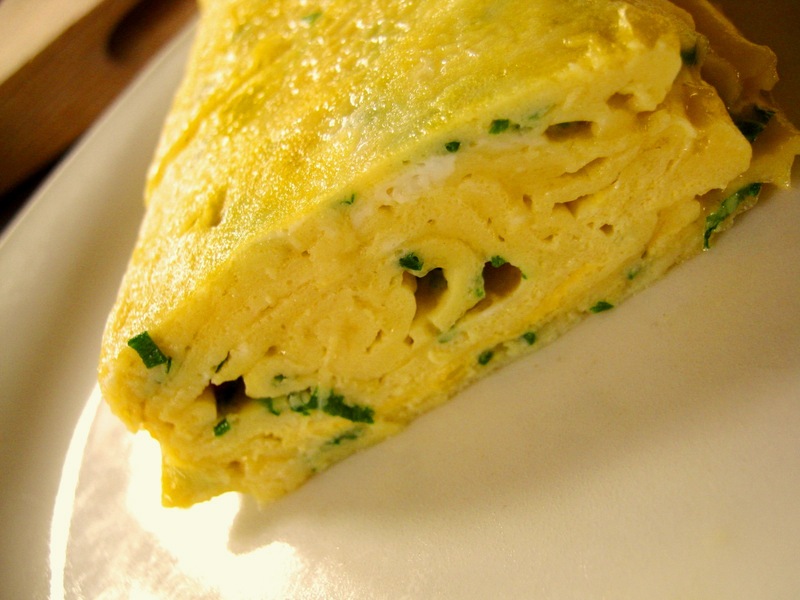 OPTIONAL: if you have finely-chopped chives, sprinkle some on the egg layer before it sets, then roll. Slice the roll to show the spiral cross-section before serving. No salt? Other recipes call for at least a teaspoon of salt for the mixture, aside from soy sauce. I opted this out if only to cut the sodium intake. Can I use other non-egg ingredients aside from chives? Yes, of course. Finely shredded leafy veggies like spinach or cabbage, or even thin meat flakes can be used. Or strips of nori. Or, my personal preference is tamagoyaki WITH CHEESE (all the more I leave out salt, since cheese can be salty) and ham. Can you eat this as is? Well, you can, if you add other ingredients like vegetables or meat. It’s like your regular omelet, except that it’s rolled instead of folded (it’s easier to roll eggs than to fold them)…and is salty-sweet. Nothing screams fast food as an egg omelet. And serving it as a tamagoyaki gives this simple, nutrient-dense dish an interesting spin for a hungry grad student. And who says the only Japanese food a grad student can have is instant ramen? I love making omelet, but havent tried rolling it before. This is a wonderful! If you wont mind I’d love to guide Foodista readers to this post.Just add the foodista widget to the end of this post and it’s all set, Thanks!